Miss Bindergarten is planning a circus and all of her kindergarteners are in on the fun! Everyone is busy preparing: painting posters, practicing somersaults, and making popcorn balls. When at last the big day arrives, there will be a parade, complete with clowns and stunts, from baton twirling to "high-wire" walking. 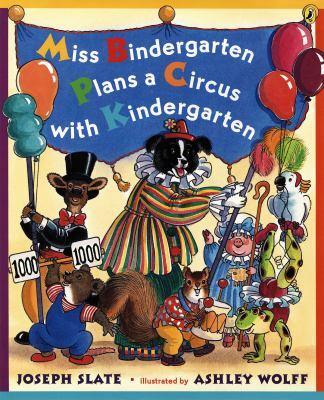 And for the grand finale, Miss Bindergarten will give the audience a spectacular, show-stopping act!Slate, Joseph is the author of 'Miss Bindergarten Plans a Circus With Kindergarten', published 2005 under ISBN 9780142402733 and ISBN 0142402737.